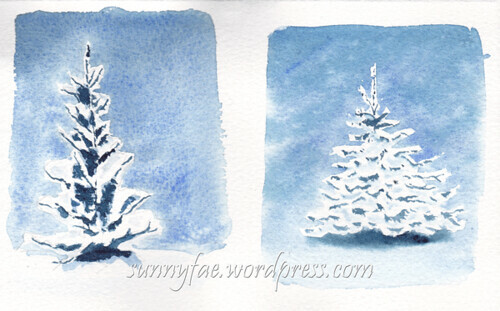 This week I have been painting winter trees. I watched a video tutorial by Maria Raczynska, she paints lovely watercolour tutorials, this week she painted lots of winter tree bookmarks on a single page of paper. I liked the idea, found a scrap of watercolour paper (student grade) and followed the tutorial. Obviously I don’t have all of her skills (yet) but it doesn’t look too bad. Winter trees from a Maria Raczynska tutorial. 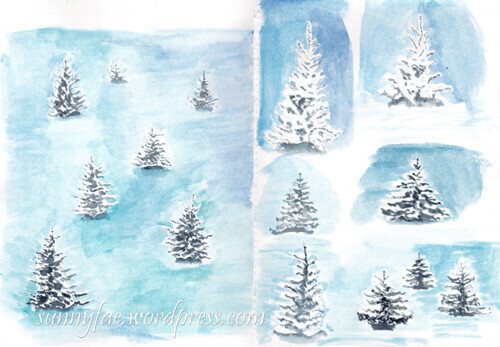 This then started me thinking about winter trees in general so after looking at winter trees on pixabay (a site that lets you use the images posted royalty free) I painted lots of them in my sketchbook. Practice is the way to go hehehe. Next I was off to find some cotton watercolour paper to practice on. These two little trees are about 2” x 3” each. Trying to make the trees look like they have snow covering the branches and not like I forgot to paint the leaves is interesting; yes I think more practice needed. The image at the top of the post is me trying to paint a little snow scene, it’s not any place in particular, just something I made up. 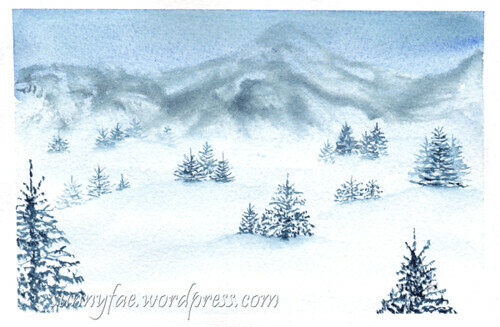 I have painted misty trees before; you can see them here if you’re interested. It’s funny what triggers the imagination and where it leads. Sunnyfae, I absolutely love your whimsical watercolour style-you are very talented. Thank you for sharing your work. I love the winter scene as well as the trees. Really nice n thank you for sharing!